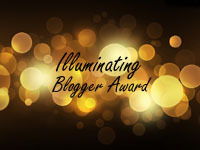 The lovely Pauleen from Family History Across the Seas has nominated me for an Illuminating Blogger Award, established by FoodStoriesBlog. Thanks Pauleen! The nominee should visit the award site and leave a comment indicating that they have been nominated and by whom. (This step is important because it's the only way they can create a blogroll of award winners). The nominee should thank the person who nominated them by posting and including a link to their blog. The nominee should include a courtesy link back to the official award site in their blog post. Select at least five other bloggers that you enjoy reading their illuminating, informative posts and nominate them for the award. Many people indicate that they wish they could nominate more so please feel free to nominate all your favourites. Notify your nominees by leaving a comment on their blog, including a link to the award site. Apparently you all need to know a random thing about me so please let me oblige you by informing you that I love bruschetta - the rustic bread, the fresh tomato, the basil.... Mmmmm - YUM! Trevor Cairney from Literacy, Families and Learning. Written by an academic/educator/researcher, I find it a very helpful blog as a mother of young children. If I need an idea for a book for one of my kids to read I try Trevor's blog. Ruth from Ruth de Vos: Textile Artist. I love reading about Ruth's art processes as she makes her beautiful quilts. I love your image here Prue. I'm amazed by how much research you manage to do with small children at home....one of the blessings of internet access! Yes, internet access is great, and occasionally I can get someone to mind the kids so I can get to the archives or wherever! Hi Prue, love your blog. I'm keen to do more family research myself when I get a chance. Thanks also for nominating me and being a faithful reader of my blog. This is where I write down the research I've been doing on my ancestors, from Australia and from overseas. I try to flesh out the people and paint a picture of them, rather than just reeling off dates and names and places. Please be aware that as time goes on my knowledge of my ancestors has changed as I have found new information, which means that more recent posts may contain more accurate information than older ones. If you believe you are a relative, please say hello in one of the comment boxes or use the contact page. Or say hello anyway!